I was not about to write a review of Turtles All The Way Down by John Green, until I was asked by a student to explain the main character's point of view. And that led to a long internal monologue, and as I revisited the pages in my memory, I felt this post coming on. John Green does teenages as well as Rowling does middle grade and Enid Blyton childhood. It's as if when he writes, for long moments, he becomes unstuck from adulthood and is a teenager himself - the effortless points of view, the angst and rebellion - only to come back to his adult self when structuring his stories. Turtles All the Way Down is a brilliant, if a little esoteric, view at a number of common and uncommon teenage struggles. Inside a Compulsive Mind... Aza Holmes is a sixteen year old and an awkward choice for a protagonist of a story. She is the best friend and self-professed sidekick of one Daisy Ramirez, a bubbly girl who writes Star Wars fan-fiction, and aspiring artist Mychal Turner. But Aza is not just any teenager; she suffers from multiple anxiety disorders - and from the very first page, John Green thrusts us right into the complexities of her mind. Aza's main anxiety has to do with human microbiome, the colonies of micro-organisms which reside in our body, and a better part of her life is spent worrying about the many infections she might contract. Aza has this nervous tick where she repeatedly scratches a callus on her finger, rinses it with soap and re-bandages it, only to scratch it open again... never allowing it to fully heal. The tragedy of her troubles is that Aza often seems too self-centered to her only friend Daisy; and this is the most worrisome fact... that we live in so oblivious a culture as to mistake chronic obsession for selfishness. One is hardly shocked to discover that Green himself has battled obsessive compulsive disorder and it's not the first time that he has revealed his insights into this struggle. In a number of Youtube videos, Green talks about what it is like to live with OCD. The "Absent" Parent... The story kicks off when Aza and her friends learn that Russell Pickett, a billionaire businessman, has gone missing and there is a big reward to find him. And it so happens that Aza went to camp with Pickett's son, Davis. Daisy is eager to use this connection to find out more about the disappearance. And Aza reluctantly agrees to rekindle a friendship with the boy. It doesn't help that her name is, literally, Holmes. An amateur attempt at sleuthing runs awry as Daisy and Aza walk right into a dangerous mystery. The cheesiness of the absent dad stereotype is not lost on us, but Green manages to flesh out a run-off-the-mill framework into something substantial. Davis Pickett has lost his mother three years before the story. And he has an odd relationship with his father, the missing billionaire. A part of him is convinced that his father has run off to avoid the many fraud investigations pinned against him; and another part, the little boy inside if you will, imagines the worst and pleads for a miracle. Davis's younger brother is not as conflicted. Convinced that his father would never leave them, the younger of the two brothers has fallen much farther into a state of depression at his absence. Internet... I feel old as I write this, and a little bit of a hypocrite, but the internet is a kicking and screaming entity, a living creature, in the lives of today's teenagers. Sure, I started a blog when I was seventeen and granted, I "spoke" to more people online than in real life; but I was an exception, not a rule. Today, most kids can't imagine a life without Youtube and Snapchat and Instagram, it's weird how strange the children in my class find that Youtube is only as old as them. In this day and age, it is perfect that the better part of the discussions and conflicts in the book stems from Aza online-stalking her boyfriend, someone subtly referencing their girlfriend in a blog, or serious Star Wars fan fiction! It gives this throbbing lifelike quality to the book and goes with the age. Today's teen is much more connected with the world around him, today's teen can put up modern art displays in secret underground galleries and we take it in a stride. The oldie that I am notices it, a kid won't. Stuff John Green does... John Green is two people in my head, the author and the youtube guy. 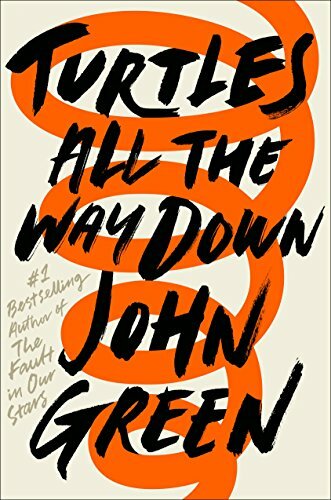 John Green the author seems to have become synonymous with "teen tearjerker books" and I expected something of the sort from Turtles All The Way Down. I'm stunned by what I got instead. I was hardly the biggest fan of The Fault in our Stars, a good book, but in this he has definitely taken my expectations by the scruff and carried them all the way to the stars. A stunning book that kills as many tropes as it espouses. One of the things I love about Green the online persona is that he can talk about anything under the sun and often talks about things I love. People in the book bloggy world talk about a "John Green effect" on teenagers; when John Green recommends something, the interest in said thing skyrockets. I was more than happy to find some of my less common favourite authors and ideas referenced in this book... Terry Pratchett the foremost. Let there be light. Lastly, if you're wondering about the title... it's a reference to an old joke. So, Bertrand Russell was giving a lecture on astronomy when a woman in the audience accused him of telling lies. The lady said that the world was no sphere, but rather a flat disc resting on the back of a turtle (think Discworld + old Hindu myths apparently) And what was the turtle resting on? This the accuser found funny, and replied, "it was turtles all the way down." The fact that we find it laughably impossible that the world may be resting on an endless tower of turtles attests to the fact that we might have no conception of how insane the world can be. Stranger things have happened. And this title brings us to the last thing that Green attempts to ask and answer; or perhaps the first thing; that existential crisis that grips us in our teenages, the question which is Aza's daily struggle, our place in it all: what's the point? One of the best books I read in 2017. Go buy it! I leave you with a quote.. Thanks for the comment, Bidisha. 2017 was filled with books that the 8th graders made me read, such surprises all of them. :) Hope you do like this. It's been so long since John Green had a book out that I forgot how delightful his dialogue can be! And it was especially welcome in a book as dark as this one. I loved that the book depicts a genuinely good and thoughtful therapist, too! Lots to be impressed by. I know a lot of people aren't John Green fans but I love his stories and the questions he asks. He's a great writer. I just wish I had him around to read as a teenager!